Unclogging toilets is not rocket science. Therefore, we are going to write a short article about this important yet interesting topic right away. We will talk about using hot water, chemicals, vinegar, special mixtures, and so on. Pour a bucket of hot water into your toilet, but do it slowly so as to avoid splashing the floor. Then flush your toilet again. If nothing happens, use a ¼ cup of your favorite detergent into your toilet. Next pour boiling water into the toilet and flush once again. If you are going to use chemicals to unclog your toilet, follow the instructions written on their packages` back. Next pour a bucket of hot water into the toilet to minimize environmental damage and rinse the pipes. Pour one cup of baking soda and one cup of vinegar into a bowl, and then wait for up to 30 minutes. Pour this mix into your toilet. You might even need to plunge your toilet to loosen its clog. Tab your toilet`s back in case the foregoing method does not work. In addition, plunging your toilet might be required if tabbing the toilet does not work at all. To loosen or remove your toilet, use an auger, a plumber`s snake or any flexible tool you find out there. 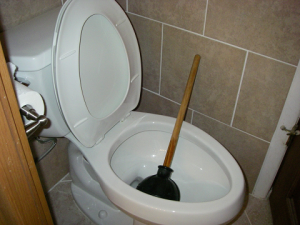 In addition, a tool does not need to go far away from a toilet`s drain as most clogs occur near the drain`s top. Wiggle this tool to loosen or poke your toilet. If nothing happens, try plunging the toilet right away. To avoid water overflow, you have to turn off the toilet`s water flow. Use a plunger and put its rubber end on the drain`s opening, and then add more water. Push your plunger up and down until the water level drops. Flush the toilet and then add a cup of your favorite baking soda and one cup of vinegar and let them sit for 5 minutes. Pour one gallon of boiling water into your toilet and then plunge again. Remember to sterilize your plunger before using this device on a sink or another drain. Pour a cup of your favorite liquid dish sop into your toilet bowl, and Dawn is one of the most effective brands of liquid dish soaps out there. Direct the liquid dish soap at your drain opening and let this soap sit for fifteen minutes, and then pour a bucket of boiling water into the toilet. Give your toilet five plunges by using a bowl plunger. Flush your toilet right away. Dish washing liquid will do the job for any less severe clog. If you cannot unclog the toilet from the very first time, repeat the process one more time. Unclogging toilets by using hot water is rather easy. However, the effectiveness of this method will depend on how deep is the problem of your toilet. Tabbing is another important method you can use to unclog your toilet, but you should do it slowly to avoid splashing water on your floor. A plumber`s snake and a liquid dish soap will help you a lot to deal with your clogged toilet.